Biodiversity and sustainable development are inextricably linked. Biodiversity, at the level of ecosystems, species and genes, forms the foundation of the Earth’s life support systems and provides the services that underpin human lives and prosperity. Our social and economic well-being depends on biodiversity, as does our future. World leaders are now gathered at United Nations Headquarters in New York poised to adopt, after several years of intense discussions, the 2030 Agenda for Sustainable Development, an ambitious set of universal goals and targets to tackle the challenges facing the world today. Given its importance for sustainability and human well-being, it is not surprising that biodiversity and healthy ecosystems, including aquatic and terrestrial wildlife and genetic resources, feature prominently in the goals and targets of the 2030 Agenda, including in poverty eradication, food security and sustainable agriculture, sustainable water management, economic growth, cities and human settlements, sustainable consumption and production, and effective, accountable and inclusive institutions. These include Target 2.4, calling on countries to ensure by 2030, sustainable food production systems and implement resilient agricultural practices that increase productivity and production and help maintain ecosystems; Target 2.5 on maintaining the genetic diversity of seeds, and ensuring access to and fair and equitable sharing of benefits arising from the utilization of genetic resources and associated traditional knowledge; Target 6.6 which calls for the protection and restoration of water-related ecosystems, including mountains, forests, wetlands, rivers, aquifers and lakes by 2020; Target 11.4 which aims to strengthen efforts to protect and safeguard the world’s cultural and natural heritage; Goal 12 on sustainable consumption and production; Goals 14 and 15, which provide extensive targets to protect marine and terrestrial biodiversity and ecosystems; and Goal 16 on peace, justice and strong institutions. The implementation phase of the Sustainable Development Goals will provide a tremendous opportunity to mainstream biodiversity and its values into key national priorities and to achieve the objectives of the Strategic Plan for Biodiversity 2011-2020 and its Aichi Biodiversity Targets. Agreed by 192 governments in 2010 and further reaffirmed in the outcome document of the United Nations Conference on Sustainable Development (Rio+20) adopted by the UN General Assembly in 2012, the Strategic Plan has been recognized as a United Nations-wide framework for action on biodiversity. Similarly, the biodiversity-related conventions that the world has agreed to over the last four decades can contribute significantly to the implementation of the Sustainable Development Goals. The seven global biodiversity-related conventions work together to harness the benefits of collaboration, and to ensure more coherent, efficient and effective implementation, both bilaterally and through a Biodiversity Liaison Group comprising the heads of their Secretariats. Each of these legally-binding conventions has a different but complementary biodiversity-related mandate. 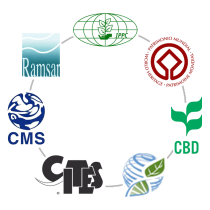 The Convention on Biological Diversity (CBD) provides a broad policy framework, with three objectives: the conservation of biological diversity, the sustainable use of the components of biological diversity, and the fair and equitable sharing of the benefits arising out of the utilization of genetic resources; the Convention on Wetlands of International Importance, known as the Ramsar Convention, focuses on the conservation and wise use of wetlands; the Convention on the Conservation of Migratory Species of Wild Animals (CMS) addresses the conservation and sustainable use of migratory animals and their habitats; the Convention on International Trade in Endangered Species of Wild Fauna and Flora (CITES) regulates international trade in listed wild animal and plant species to protect them against over-exploitation through such trade; the International Plant Protection Convention (IPPC) helps governments protect plant resources from harmful pests; the International Treaty on Plant Genetic Resources for Food and Agriculture (ITPGRFA) strives to guarantee food security; and, the World Heritage Convention aims to protect and cherish the world’s natural and cultural heritage of outstanding universal value, linking together the concepts of nature preservation and the preservation of cultural properties. As we embark on the implementation of the 2030 Agenda for Sustainable Development, we must ensure that our work is truly transformative and puts this new integrated approach into action. The global challenges we face are cross-cutting issues that will require us to work with many different partners and stakeholders, across different entities, governments and sectors. The decisions taken by Parties to the biodiversity-related conventions represent a ready-made foundation upon which a rapid response to the challenges of sustainable development can be made. All of the biodiversity-related conventions work through partnerships and initiatives with a range of other UN agencies and entities, many of which are focused on economic and social development, natural resource management, trade, security and other areas. Parties have clearly recognized that in order to achieve the goals of these conventions, biodiversity needs to be mainstreamed into other sectors. The governing bodies of a number of the Conventions will meet over the next 18 months. The seventeenth meeting of the Conference of the Parties to CITES, to be held in South Africa during September/October 2016, will adopt decisions on regulating access to and trade in wildlife resources, combating illicit trafficking in wildlife, enhancing collaboration with other sectors (e.g. development, trade, transport and tourism) and making more visible the Convention’s contribution to achievement of the Aichi Biodiversity Targets as well as the 2030 Agenda for Sustainable Development. At the thirteenth meeting of the Conference of the Parties to the Convention on Biological Diversity, to be held in Mexico in December 2016, Parties and stakeholders will have the opportunity to consider concrete ways to mainstream biodiversity across a variety of sectors and areas including agriculture, forests, fisheries, health and sustainable tourism, and to address next steps related to the 2030 Agenda for Sustainable Development. By working together, we can achieve the future we want.